Take Route 22 West to Route 202 South to the Somerville Circle. From the Somerville Circle Take 206 South towards Princeton. Continue on 206 South and turn right onto County Route 514/Amwell Road. At second traffic light turn left onto Raider Boulevard. School is on the right. Turn Right onto Homestead Road. Parking and Fields are on the right. Located in behind the Lowes/Wal-Mart Parking Lot off of Route 31. Please make sure to park in the designated areas. You can not park directly in front of WalMart for football games. Thank-you. Wal-Mart has allowed parking in their lot when attending the games but you MUST park down by the garden center. If you park in the “non-parking” area for a Patriot game, you will be asked to move your car. If you are asked to move your car please do not give the parking attendant a hard time…just move your car to the appropriate parking area as instructed. From South: North on Rte 31/202. At Flemington Circle follow to Rt. 31 North when 202/31 splits. Follow Route 31 North to 3rd light, Route 523/Junction Road. Parking lot E will be on your right. From North Jersey via 202: At Flemington Circle make right hand exit following Rt. 31 North. Follow directions above. From North/West Jersey: Take Rt. 78 East to Rt. 31 South/Clinton. Follow Rt. 31 South until you pass the Lowes/KMart shopping center. Make a left hand turn onto Walter Foran Boulevard [first light after Lowes/KMart]. Make first right onto Route 523 South/Junction Road and follow to parking lot E.
Take William Street to end and enter parking lot bearing right into the Manning Park. The Pioneer fieldis on the left side of the parking lot. Take Route 31 North past the Flemington Circle. 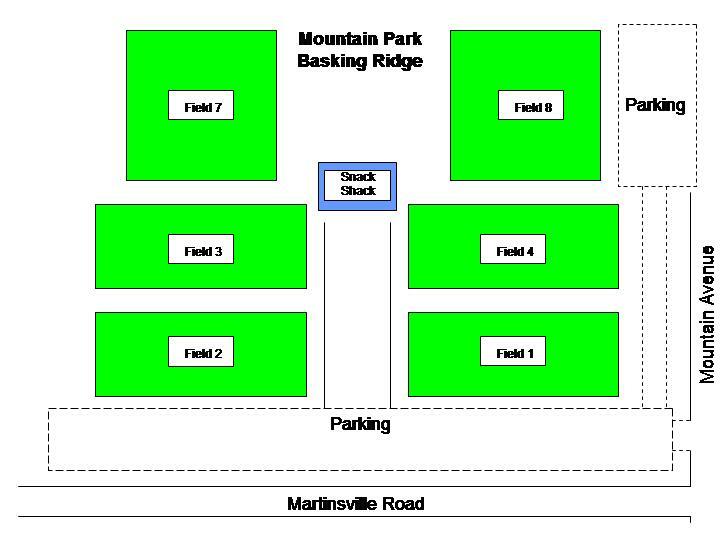 The Pioneer field is on the left side of the parking lot. - Route 287 South or the Garden State Parkway South to Route 78 West. - Follow directions for Route 78 West as above. - Route 287 North or the Garden State Parkway North to 287 North to Route 78 West. mile to the school on the right side of the road. The school is set back from the road, but there is a sign at the entrance. Take route 78 east. Get off exit 18 onto Rt. 22 east. (This is the exit after route 31 south. It is east of Clinton). Follow Rt. 22 to the jug handle prior to the fourth traffic light ("Cokesbury/Lebanon"). route 22 east. Follow route 22 east to the jug handle prior to the fourth traffic light (Cokesbury/Lebanon"). Take the jug handle, cross route 22, and drive north toward Cokesbury on Cokesbury Road. Follow Cokesbury Road for approximately 3/4 mile. The school is set back from the road, but there is a sign at the entrance. From the East: Take I 78 West to Exit 3. Exit on to Route 22 West and continue into Phillipsburg. About 1/2 mile before the Delaware River bridge you will see the US Post Office in the area between the West and East bound lanes. Simultaneously you will see the football field on the right. Turn right on Hillcrest just after passing the football stadium. The school is up the hill on the right. From the West and Pennsylvania: Take I 78 East to Exit 3. Make a left off the exit on to Route 22 West and continue into Phillipsburg. About 1/2 mile before the Delaware River bridge you will see the US Post Office in the area between the West and East bound lanes. Simultaneously you will see the football field on the right. Turn right on Hillcrest just after passing the football stadium. The school is up the hill on the right. From Newark, NJ: Take I 78 West to Garden State Parkway/Clinton. Take Exit 3 and continue until you see the US Post Office in the area between the West and East bound lanes. Simultaneously you will see the football field on the right. Turn right on Hillcrest just after passing the football stadium. The school is up the hill on the right. From Trenton, NJ: Take NJ-33 W. Merge onto NJ-29 N via the ramp- on the left. Merge onto I-95 N via the exit on the left toward New York/Mercer Airport. Turn left onto Bear Tavern Road/CR-579. Continue to follow CR-579. Merge onto US-202 N/NJ-31 N toward Flemington. Enter next roundabout and take 2nd exit onto NJ-31 N. Merge onto I-78 W/US-22 W via the ramp on the left toward Phillipsburg. Take Exit 3 (Phillipsburg/Alpha) and continue on Rt 22 until you see the US Post Office in the area between the West and East bound lanes. Simultaneously you will see the football field on the right. Turn right on Hillcrest just after passing the football stadium. The school is up the hill on the right. From Stroudsburg, PA: Take I-80 East. Turn right onto N Delaware Dr./PA-611. Turn left onto Main Street/PA-611. Continue to follow PA-611. Turn left onto Garden Street/PA-611. Merge onto US-22 E. Take the Main / Broad Street ramp toward Phillipsburg. Turn right onto US-22 Alt/Broad St. Continue to follow Broad Street. Turn right onto 3rd St. Merge onto US-22 W toward via Toll Bridge/22 West Easton. Take the ramp on the left after the post office and you should see the high school. Go up the hill and the high school is on the left. Take Warrenville Road north. Stay straight on Warrenville Road which becomes King George Road. Cross over route 78 and continue through light at Millington Baptist church (Rt 512/Valley Rd) Do not turn left on Rt 512, which goes past the Veterans Hospital. Continue straight the road becomes Rt. 613 (Stonehouse Rd.) At light bear right. Stay on Rt. 613 it becomes So. Finley Ave. HS is on right. From the West East on I-78 to Exit 33 (Martinsville). Turn right (south) on Liberty Corner/Martinsville Road approx 1.5 miles to Mountain Ave Light. Make a right onto Mountain Ave and a left into the parking lot. From the South North on Route 206 to I-287 north. Right on I-78 (toward Newark) to Exit 33 (Martinsville). Turn right (south) on Liberty Corner/Martinsville Road approx 1.5 miles to Mountain Ave Light. Make a right onto Mountain Ave and a left into the parking lot. From Route 22 West to Warrenville Road. Right on Warrenville. Continue up the mountain through the center of Warren to the light at Mount Horeb Road (Lukoil Gas Station on your left). Make a left on Mount Horeb Road and continue to the end. Make a right on Liberty Corner/Martinsville Road. At next light, Mountain Ave, make a left and then a quick left into the parking lot. Take exit 17 to merge into Rte 31 North. Pass two traffic lights. Turn Right at Cregar Rd (just before a third traffic light). Turn Left at the next stop sign (Fairview Ave). Drive about a mile. The High School will be on your right. Take exit 16 and follow signs for Rte 31 North. Merge into Rte 31 North. Pass two traffic lights. Turn Right at Cregar Rd (just before a third traffic light). Turn Left at the next stop sign (Fairview Ave). Drive about a mile. The High School will be on your right.